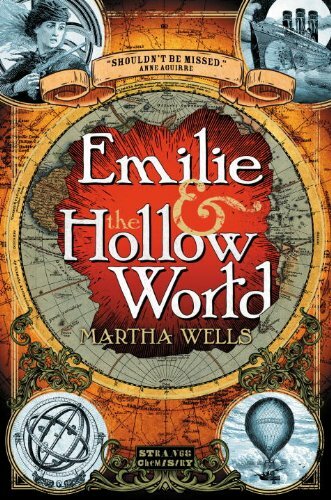 Emilie and the Hollow World , the young adult debut from well-known fantasist Martha Wells, is a study in nostalgia. Perhaps that could be said of many neo-Victorian works, not to mention many other works of secondary world fantasy, where the setting is deliberately used to evoke a bygone era which both reader and author could not possibly have experienced. However, the level of nostalgic detail here goes far beyond the spyglasses, steamships, and magical "aether" which litter Emilie's world, extending instead to the novel's core themes, narrative choices, and handling of romance. But I'm uncertain as to whether this romp through yesterday will appeal to the teen readers of today. In fact, we're told that Emilie yearns to be an "adventuress—not the romantic kind who got into trouble—but the intrepid kind who explored unknown territories and made discoveries and visited all sorts of strange places" (p. 65). Wells clearly intends this to be a feminist spin on these traditional stories. Not only is a girl at the center of it all, but we're told that Emilie's friend Porcia (who has been "training herself for adventures" [p. 65]) explicitly plans to eschew marriage, all the better to let herself ignore quasi-Victorian dictates on appearance and behavior. This would have been an admirable argument for a girl of the real Victorian era to make, of course, and while I'm not going to begin to suggest that we live in a post-feminist world (we don't), Emilie's position on matrimony feels more than a little bit well-worn. After all, Disney has given us girls resistant to marriage for decades, most recently in the computer-animated Brave (2012). What's more, the formulation of this argument is presented without any acknowledgement for the possible diversity of women's experiences. Emilie has little desire for romantic companionship (she's "impervious to physical attraction" [p. 273]), and the other women we're meant to admire all feel similarly. There’s no debate, no acknowledgement that for other women—the modern audience, say—love might ever be good. Though optimistic, and in some ways admirable, the book's entire central conceit itself feels dated, lacking the complexities introduced by modern feminism. Without the traditional romantic trappings (or even true acknowledgement of adolescent yearnings) of other young adult novels, Wells turns instead toward adventures and exploration. The eponymous "hollow world" is nicely textured—filled with creatures like mermen and the reptilian Cirathi. But the sad truth is that while the world is somewhat compelling, the story itself is not particularly gripping or even quite engaging. This is largely Emilie's fault. She is meant to be a plucky, resourceful sort of heroine, but Wells keeps her at arm's length from the reader through a quaint third-person narration. This also contributes to the novel's old-timey feel; first-person perspective is so common in modern YA that it's almost requisite, though a surprising number of Strange Chemistry titles—including Gwenda Bond's Blackwood (2012), Jonathan L. Howard's Katya's World (2012), and Christian Schoon's Zenn Scarlett (2013)—are told in a more distant third. Though some of these stories are quite successful, these days third-person prose is more usually found in either adult or middle grade novels, for good reason. Both curious younger readers and cynical adult audiences are often quite happy reading about protagonists with which they do not identify. However, preeminent among the desires of adolescent readers is the ability to empathize with a story's protagonist. This identification often forms the plot's core, spurring us through the story and naturally upping the stakes; because we are fooled into believing that we are the speaker, we care deeply about what happens to her. Distant narration does have its place—it's great for unlikeable protagonists, or for showing a wide range of perspectives over the course of a narrative. But Emilie is not unlikeable and the narration follows her closely. It's clear that Wells is using the perspective merely to evoke older literature, but it certainly stood in the way of any deeper identification with Emilie for this reader. But perhaps I had trouble identifying with Emilie because she's also not particularly deep. We’re told she's a daring rapscallion, and she does contribute to the adventures at hand somewhat, but she's surrounded by brighter, bolder, and more distinctive characters: Miss Marlende, lady traveler; Kenar, a distinctively alien fellow; mysterious Lord Engal. Through the novel's first half, Emilie is largely used as a passive viewer for their activities. Additionally, though I suspect we're meant to empathize with her due to her repressive upbringing, we never actually see her supposedly cruel aunt and uncle. We're only ever told about a single fight they had, which feels like thin motivation for running away. When Emilie swears she'll "never see her aunt and uncle again, not if she had to run to the ends of the earth" (p. 85), it sounds melodramatic, not relatable. We're not grounded in her perspective, and because we never experience these events which would render her a sympathetic character firsthand—because our focus is on individuals other than the protagonist—the novel feels rather tetherless at times, not to mention forgettable in a crowded market of novels by young adult authors like Tamora Pierce and Kristin Cashore. Though the fantasy tomes created by these authors are, likewise, rendered in third person, their protagonists are nevertheless prime identification objects, and the feminist themes tackled within the pages are suitably sophisticated for an older adolescent audience. But Emilie and the Hollow World , with its lively setting and nascent feminist themes, might be thought-provoking for those who have not yet discovered a more complex and modern feminism. Middle grade readers—several years younger than YA audiences and not yet as interested in immediate character identification or romance—may likewise be less bothered by Emilie's distinct lack of distinction, and more easily swayed by Wells's worldbuilding and good intentions. Which isn’t to say, of course, that there aren't middle grade writers who approach their audience with sophisticated or emotionally pressing themes—novelists like Laurel Snyder and Greg van Eekhout are proof of this. But to score a real hit with older young adult audiences, depth of emotion; an engaging, distinct, and fully formed protagonist; and thematic complexity are requisite. And it's in these ways that Emilie and the Hollow World largely falls flat. Phoebe North writes SF for teenagers. Her first book, Starglass , comes out in July from Simon & Schuster Books for Young Readers. Visit her blog at www.phoebenorth.com. Great review, Phoebe and I completely agree. I felt the book lacked complexity and sophistication in the development of its ideas. Having read - and loved - other books by the author and knowing that lack of depth and complexity is NOT a problem in her adult novels, I can't help but to fear that this was simply dumbed down to its intendend audience. Thanks, Ana! I was really looking forward to giving Wells a try, having heard such glowing things. There was potential here (I could see more development in a sequel, perhaps) but it's a shame it just wasn't up to her reputation! I haven't read this book myself, but I have a couple of slight problems with this review. 1) While I certainly subscribe to the idea that there's no conflict between feminism and heterosexual love relationships (I'm a happily married feminist myself), I must admit that it's a bit refreshing to have a novel where the female protagonist is actually uninterested in love and marriage and stays so for the duration of the story. In my experience, it is by far more common for stories to introduce a female protagonist who swears never to be tied to a man, only to have her change her mind as soon as the requisite handsome love interest enters the stage. Neither storyline sends a particularly good message, but I think the latter type is more annoying, on account of being more common. 2) I take issue with the idea that third person narration prevents the reader from identifying with the protagonist. I have read many, many books written in the third person where I have identified with the protagonist. Other than that, excellent review. Christina, I'm fine with heroines who are disinterested in love and marriage; I'm not particularly comfortable with the view that those who seek love or marriage are by default less admirable or adventuresome. Young women today have a diversity of choices about their romantic futures, and this wasn't in any way depicted here. As for point of view, I agree that third person isn't an absolute barrier to identification. But first person is an easy shortcut to identification, along with other methods of making us care deeply and personally about a protagonist. Wells doesn't make us care, and the point of view is only one of several barriers to that here, as outlined in the review.